For a current-day viewer to contemplate how Around the World in 80 Days won the 1957 Best Picture Oscar (in addition to four other statuettes), either imagination or time-travel is required. (The latter being more appropriate for H.G. Wells than Jules Verne.) By today’s standards, there’s nothing “best” about the sprawling epic…unless one is handing out citations for Best Travelogue. With its lazy, somnambulant pace and endless stream of cameos, Around the World in 80 Days seems to be unfolding in real time. Yet if one steps back and considers how this would have been received some 60+ years ago, it starts to make sense. With its widescreen format, eye-popping technicolor palette, and immersive camera placement, Michael Anderson’s most successful big-screen endeavor represented spectacle at its finest. And, after awarding smaller, character-oriented films the top award for three consecutive years (From Here to Eternity in 1954, On the Waterfront in 1955, and Marty in 1956), the Academy decided to go big. And, for better or worse, nothing was bigger (or more bloated) than Around the World in 80 Days. The book upon which the film is based is an engaging, serviceable read. It’s less than 150 pages and can be comfortably enjoyed in one sitting. (It would likely take less time to read the book than see the movie.) It engages the imagination. The 1956 movie version substitutes stunning visuals for the latter and seems determined to keep viewers watching for as long as possible. Although several truncated versions of the film exist (including a commonly available edit of 167 minutes), the “official” one clocks in at about three hours. In addition to adding two sequences not found in the source material (a ride in a hot air balloon and a bullfight), the film expends lengthy amounts of time following the gaze of characters as they move around the world. It’s all very relaxed and at times more than a little tedious. There are some pretty shots, though. And at no point is the production detail, which is rich with on-location shooting, anything less than impeccable. Despite a literal cast of thousands, there are only four actors with significant parts. The lead is David Niven, who plays the eccentric Phileas Fogg – an adventurer who arrogantly states that he can circumnavigate the globe in 80 days. In the Victorian era, predating air travel, that would have been quite a feat and the other gentlemen at Phileas’ club are skeptical – so skeptical that, when he wagers 20,000 pounds that he’ll be able to do it, he finds no lack of takers. (In today’s money, that’s about $3M.) Accompanied by his newly-hired valet, Passepartout (Cantinflas), he embarks on the journey, which takes him from London to Spain to Brindisi to India, Hong Kong, and Yokohama before crossing the Pacific to San Francisco. The trip involves a variety of methods of transport, ranging from the “usual” (trains and ships) to the odd (a hot air balloon to cross the Alps and ostrich-drawn rickshaws on the streets of Hong Kong). In Suez, Scotland Yard Inspector Fix (Robert Newton) begins trailing Phileas and Passepartout, believing the former to have robbed the Bank of England. His intention is to detain him in a British territory but the arrest warrants frequently don’t arrive until after Phileas is gone. Eventually, he contacts the duo, posing as a fellow world-traveler. In India, they rescue the beautiful young Princess Aouda (Shirley MacLaine) from death by burning and an attraction subsequently develops between her and Phileas (even though it was Passepartout’s quick actions that saved her life). As an adventure tale, Around the World in 80 Days is only occasionally successful. Many of the would-be “action” sequences, such as the bullfight and the rescue of Aouda, are relatively sedate and unlikely to raise the pulse. The only time the movie generates suspense is when it gets to North America. In one sequence, a train is forced to travel over a collapsing bridge. In another episode (one that might be considered politically incorrect by today’s standards), the locomotive is attacked by Native Americans (the Sioux) and Passepartout becomes separated from Phileas and leads a group of warriors on a horse chase. The film’s comedy, which is generally low-key and often tongue-in-cheek, is effective. This is especially true during the introductory sequences in the club when the filmmakers enjoy sending up the stuffiness of such institutions. Throughout the entirety of the 180-minute running time, the tone remains lighthearted – a quality that prevents the movie from becoming unbearable. The romantic elements, unlike the comedic ones, utterly fail. This is largely because no attempt is made at character development, especially where Aouda is concerned. She serves no function except to exists as a “love interest” and the lack of attention devoted to her is a source of minor frustration. Around the World in 80 Days was the first film to feature a tsunami of cameos, with more than two-dozen high-profile actors doing the work of extras. These include such luminaries as Noel Coward, John Gielgud, Trevor Howard, Charles Boyer, Cesar Romero, Ronald Colman, Peter Lorre, George Raft, Red Skelton, Marlene Dietrich, John Carradine, Frank Sinatra, Buster Keaton, and Edward R. Murrow (who provided the introduction). Among those who refused or were passed over for appearances were John Wayne and Orson Welles. 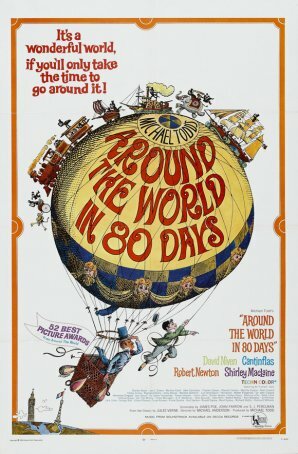 In 2004, Disney embarked on a big-budget remake of Around the World in 80 Days that was more a re-imagination of the story that a strict recreation of the 1956 movie, although the latter proved to be an obvious inspiration. Despite being only about two-thirds the length, the movie wasn’t better paced and, as a result, seemed more like an imitation than a new interpretation. (Its list of cameos, however, is equally impressive.) Taken together, the two films offer a compelling argument that, as beloved as the Verne book may be, it might not be ideal for the medium of film. Although Around the World in 80 Days offers gorgeous visuals, that’s not sufficient justification for watching a film – any film – for three hours.